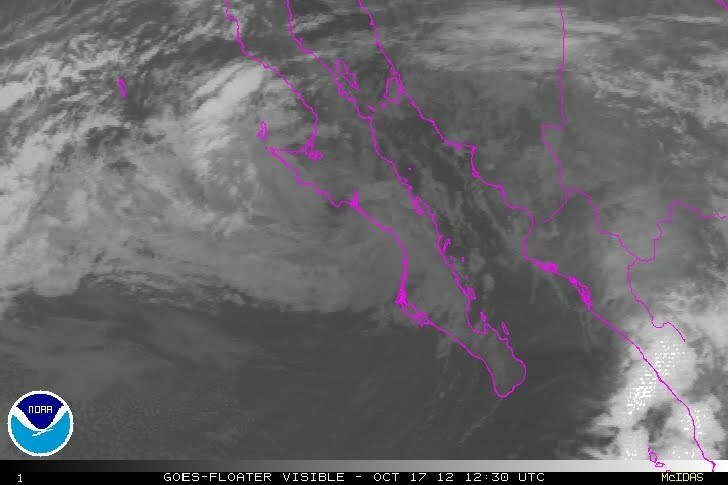 Center of Paul remains close to the coast of Baja California del Sur.Expected to weaken into a depression later today. We apologize for interruption on report publishing. There was no Internet and Cellphone service. According to TV reports/interviews with TelMex representatives this condition applied to all of Baja California Sur respective - according to a second reportage - to the area from Cabo San Lucas to Loreto from mid afternoon yesterday until late into night/early morning, (we try last 23:20hr). In La Paz self we experienced app. 1 hr. of heavy rainstorm and some more rain on and off for 1/2 the day. At 05:00hr PDT the center of Tropical Storm Paul was located near latitude 26.8 north/longitude 113.8 west. Paul is moving toward the northwest near 20km/h - 13mph and this motion is expected to continue today for the next couple of days. 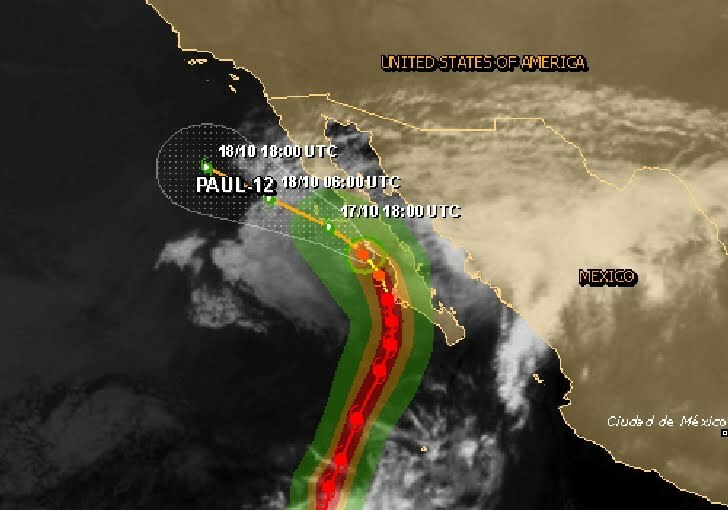 On the forecast track the center of Paul will move along the West Coast of the Baja California peninsula through this afternoon and then move away from the Baja California peninsula tonight and Thursday. Maximum sustained winds have decreased to near 65km/h - 40mph with higher gusts. Continued weakening is forecast during the next 48 hours and Paul should become a tropical depression later today. Paul is expected to become a remnant low pressure system by tonight and dissipate on Thursday. Paul is expected to produce additional rainfall amounts of 1 to 2 inches over the central Baja California peninsula. Isolated maximum storm total amounts of 10 inches are possible in association with Paul. These rains could produce life-threatening flash floods and mud slides, especially in areas of mountainous terrain.